LOS ANGELES, CA--(Marketwired - April 26, 2016) - The Steve and Marjorie Harvey Foundation (SMHF), a nonprofit dedicated to fostering excellence in the lives of underserved youth, partners with MobileCause, the world's leading mobile and online fundraising and communication software for nonprofits, to support the Steve Harvey Ride for Charity, a month-long fundraising campaign to raise awareness for the Foundation's nationwide programming and mentoring camps, global service experiences, and scholarships to assist fatherless youth in pursuing higher education. The campaign kicked off on April 4th with Steve Harvey embarking on an epic 4-week ride, live streaming himself biking or walking for the 4-hour duration of his nationally syndicated daily radio program. During the broadcast he urges listeners to support SMHF in helping young men and women be the best that they can be by donating any way they can -- through online giving on the Foundation's website, check by mail, and most notably by texting the keyword STEVE to 91999 from their mobile phones to receive an instant reply with a link to a secure SMHF online giving donation page. "We are honored that Mr. Harvey and his wife chose MobileCause to play a role in helping to raise funds for their Foundation and the important work they do," stated Sean MacNeill, MobileCause CEO. "Text to give is the perfect nonprofit fundraising solution, especially for radio, because it streamlines the giving process by allowing donors to give in seconds, anytime, anywhere right from their mobile devices using a simple call-to-action that can be shared across channels." 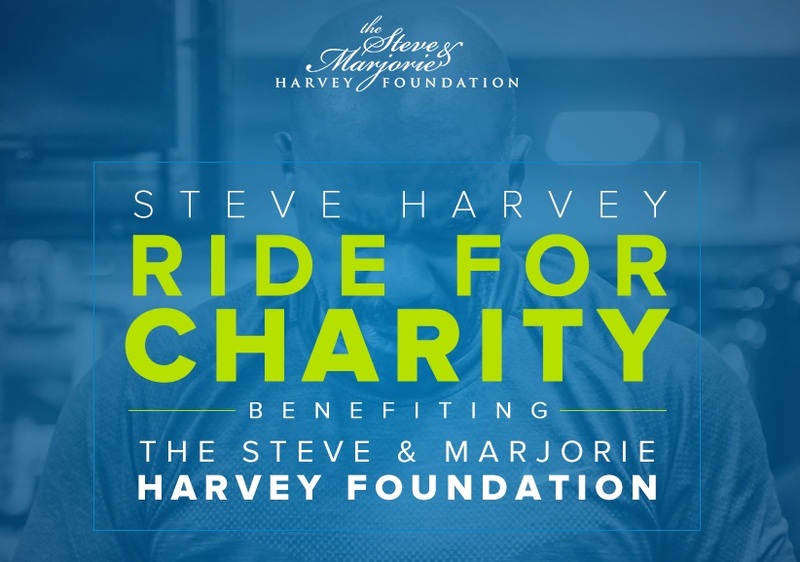 Now in its 3rd week, the Steve Harvey Ride for Charity has already raised nearly $500,000 through MobileCause and an additional $64,250 through offline donations. The organization is looking for one final push in the last days of the campaign from supporters with donations big and small. "The outpouring of support we've received since I started this has been inspiring," commented Mr. Harvey after completing another grueling 4-hour-long radio program and exercise session. NordicTrack has generously sponsored the Ride for Charity by providing Mr. Harvey's exercise equipment for the unique campaign, which continues to gain momentum with fans, supporters, and celebrities calling in to commend him on his efforts, provide encouragement, and contribute to the cause, including comedic actor, writer, and producer Kevin Hart, who donated $50,000. SMHF provides two programs for disadvantaged and fatherless children: The Steve Harvey Mentoring Program for Young Men, and Girls Who Rule the World. Both promote educational enrichment, one-on-one mentoring, and global service initiatives to cultivate the next generation of responsible leaders. "As I sit there pedaling on the bike and see names scroll on the screen, I can see everybody that gives. I keep it in front of me because it motivates me," Mr. Harvey continued, "Even if it's only a dollar, I know it's money to help us serve more young people. And it takes a lot. But I'm doing it, I'm going to keep on going until we get it done." Supporters can tune in to watch the live stream on YouTube, Facebook, and Periscope weekdays from 6AM-10AM EDT through April 25th. 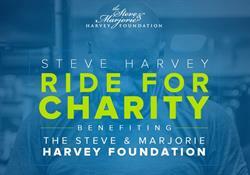 Learn more about the Steve and Marjorie Harvey Foundation. To make a donation to the Steve Harvey Ride for Charity text STEVE to 91999 or donate online at www.iamsteveharvey.com/charity-ride. The mission of The Steve and Marjorie Harvey Foundation (SMHF) is to provide outreach to fatherless youth, by promoting educational enrichment, leadership skills, one-on-one mentoring and global service initiatives that will cultivate the next generation of responsible leaders. We empower young people to realize their biggest dreams by By exposing them to strong, positive role models who embody the possibilities for the future and equipping them with the skills they need to go back home to change their communities, the nation, and more importantly, the world. MobileCause is the world's leading provider of mobile and online fundraising and communication software, helping educational, faith-based, healthcare and charitable nonprofit organizations reach their goals with a full suite of customizable, mobile-friendly solutions including crowdfunding and peer-to-peer fundraising, online giving, event fundraising, advocacy, mobile communication, and full merchant services. MobileCause is trusted by thousands of the world's leading nonprofit organizations including United Way, The Salvation Army, American Heart Association, University of Southern California, Habitat for Humanity and many more. To learn more, visit www.MobileCause.com.